My honeysuckles are in bloom. Now I know that honeysuckles aren't the flashiest of flowering shrubs, but while drinking my coffee on the porch this morning, all I could hear was the drunken humming of honey bees. They were so busy and so laden with pollen that they could hardly fly and seemed to be walking from blossom to blossom. This time of year is always a miracle of colour and sound. As I write, the smell of lilacs slips by and the nest of blue jays in the maple are demanding more food, more food. There's nothing like winter to make you appreciate spring. Speaking of flowers, I finished the quilt made from my bee friends' flower blocks. I have very unimaginatively called it spring flowers. I decided to sash the individual flowers with fabric that remind me of grass. Keeping with the analogy, for the binding I chose a fabric that could be imagined as a picket fence if you look closely. Should I have sashed it in white, probably, but it's bright and happy and it will likely cheer up someone's bed at the nursing home my mother lives in. The fun thing about online bees is that a group of strangers get together and trust each other enough to send blocks made with their favourite fabrics. For me it's like Christmas when the blocks arrive. Sometimes the fabric is exactly what I would have bought and sometimes not, but they always play well together. The back is a perfect example of why we should measure twice and cut once. I did not! I tried to casually toss the quilt over the honeysuckle bushes, but the wind kept thwarting my art shots! Here it's casually draped over the cover to the spring (supplies water to our house and barn). In the background you can just see one of the raised vegetable beds. 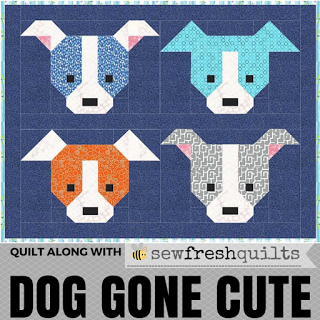 I'm linking up to Sew Fresh Quilts, so have a good look at all that creativity out there. Sadly, this is the last week of The Needle and Thread Network and I would like to thank her for creating a space for us to show our work. Winter truly does make us appreciate Spring all the more. 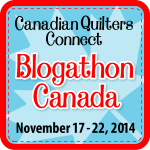 Margaret, I think the green sashing is great and this whole quilt will bring cheer to someone! Hooray for you! Love how colorful the quilt is. What a lovely post and very pretty finish, Margaret. I love the look of those flower blocks sashed in the green. Think of the backing as a creative design element. It looks fantastic, too! 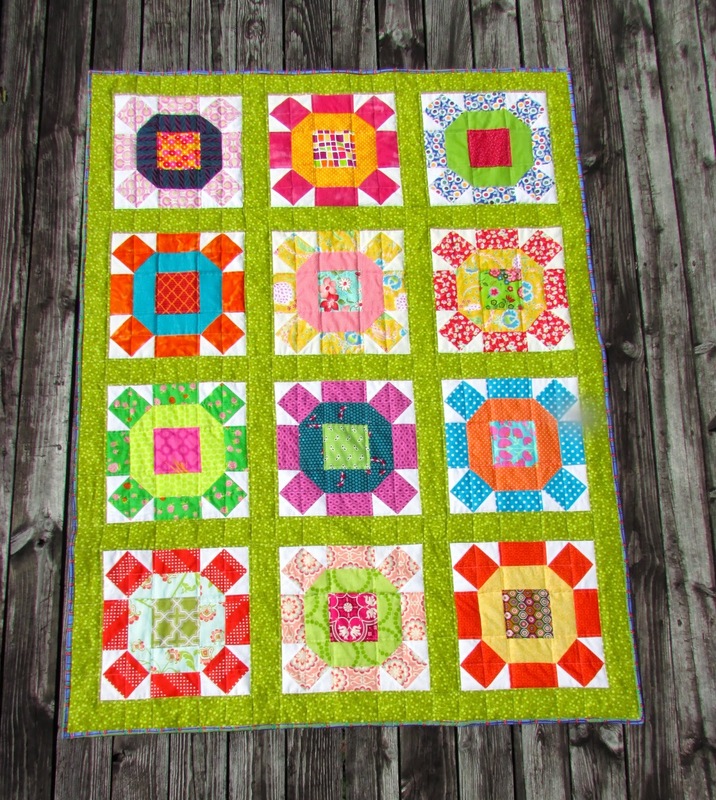 Such a pretty and happy quilt! I love the flowers and all together...gorgeous! This is beautiful, Margaret! I love the happy green sashing. Fabulous quilt! And you were quick! All the blocks look so fantastic with that sashing.Yeah for the new Monica, and welcome! I love everything about this quilt...that I'm going to hunt down that pattern!!! It will truly brighten someones day in the nursing home and become a favorite for sure!! Just love it!!! !